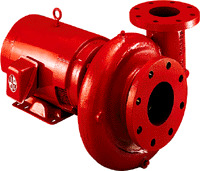 Series 1531End suction, close-coupled, foot-mounted pump available in 1-1/4 through 6 sizes. Motor size 3/4 to 50 HP at 1750 RPM, 2 to 60 HP at 3500 RPM. Available in bronze-fitted, all-iron and all-bronze construction with flows to 2300 GPM, heads to 400 feet. Close-coupled, space-saving economy plus rugged construction make the Series 1531 an ideal selection for a variety of horizontal and vertical mount applications. Available with the B&G standard self-flushing Carbon/Ceramic mechanical seal in 175# working pressure design.